Mrs Dragon's Den: Happy Anniversary and Kitties! And speaking of things that are cute--my husband and I are finally counting down until we can get...kittens! I have wanted kittens for (seriously here) 6 years. When my college roomie and I moved into our very first apartment we adopted a kitten. A couple months later she called me up to announce that she was bringing another one home. (Never go to the pound "just to look", you end up with far too many pets that way.) The first one developed a strong attachment to her, and she thought that "the boys" couldn't be separated, so when I moved in with my husband two years later, she kept the cats. So, once I came to that conclusion, what did I do? I hopped on etsy to check out cat stuff! Cat toys, cat beds, cat tags, cat collars, oh my! As a tribute to our soon-to-be new family members, I will be posting one cat item of awesomeness each day this week. 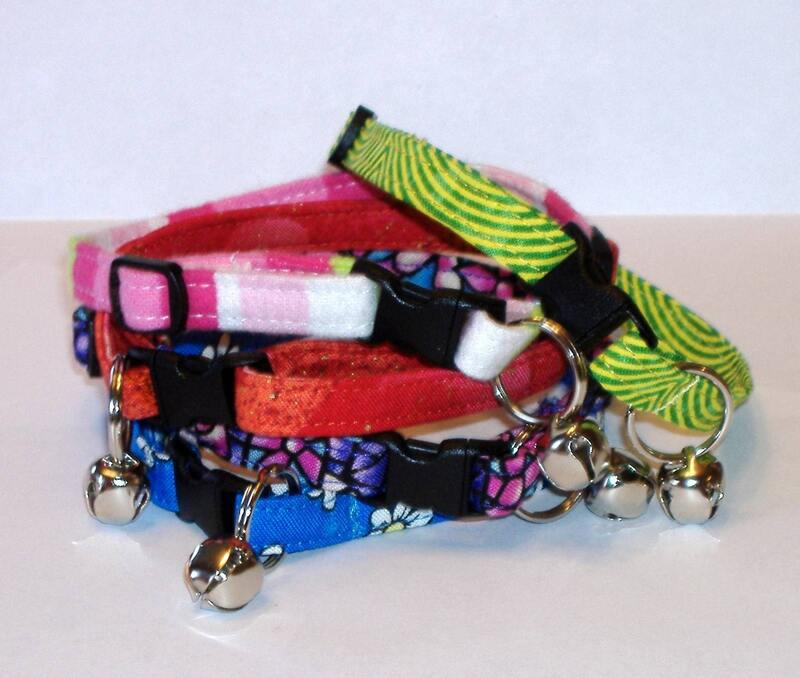 Today's items are breakaway collars with bells, handmade by the talented pawsntails. You can select a custom fabric for each collar and the breakaway style ensures that should our little house kitties ever escape they can't be strangled or stranded if their collar catches on something. The bells are very helpful for keeping track of small and curious little kittens who tend to do things like climb into places they can't get out of or get into things they shouldn't. Keep half an ear open and you can know when it's time to go looking for them. And for a price that beats the mass-produced ones at the pet-store there is no reason NOT to buy handmade! Thank you so much for including my collars in your blog! I hope you have fun picking your little friends this weekend...they are so irresistible when they're tiny.